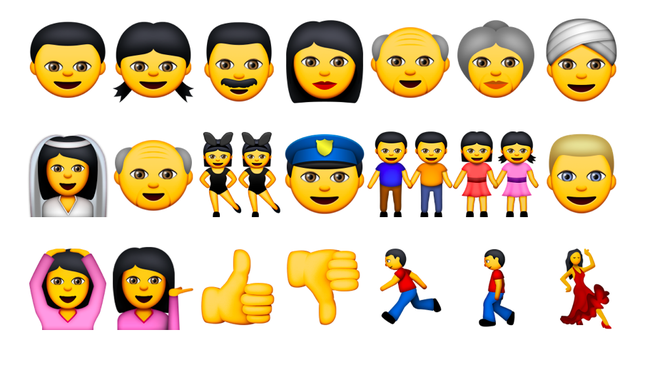 Update April 2015: iOS 8.3 and OS X 10.10.3 have been released, and some of the emoji details have changed. The pre-release versions of OS X 10.10.3 and iOS 8.3, released to developers today, feature a range of emoji updates by Apple. Changes include new emoji categorization, new country flags, updates to old artwork for a few select emojis, and support for racially diverse emojis. 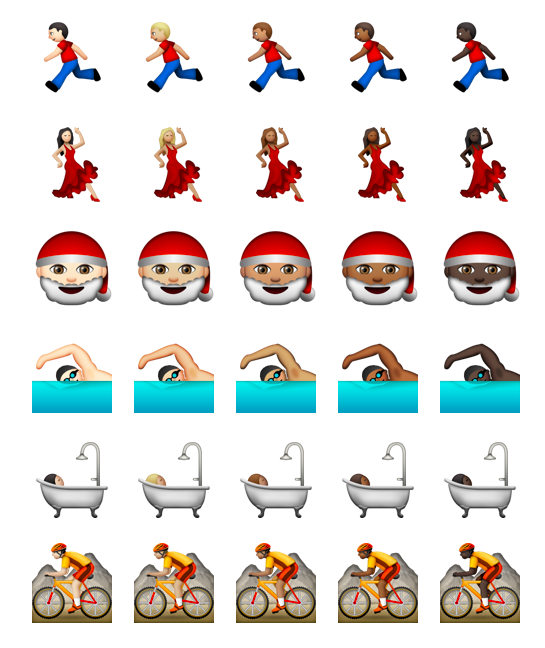 Apple is taking advantage of the new emoji skin tone modifiers, recommended by the Unicode Consortium in November 2014. A small arrow appears next to the characters that allow skin tone modification. Clicking the arrow offers a choice of five different skin tones, in addition to the default (yellow) skin tone. Choices for skin tones include pale, cream white, moderate brown, dark brown, and black. The skin tone chosen can affect other features, such as the hair color. For example, the lightest skin tone tends to display brown hair, while the second-lightest skin tone has blond hair. Above: Boy, Girl, Man and Woman with the five natural skin tone choices shown. 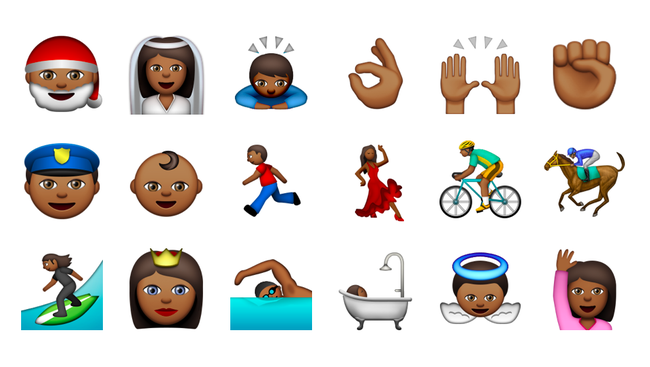 As per the Unicode recommendations for these emojis, the default skin tone has changed from white, to a race-neutral yellow color. The white variations remain available through the skin tone picker. 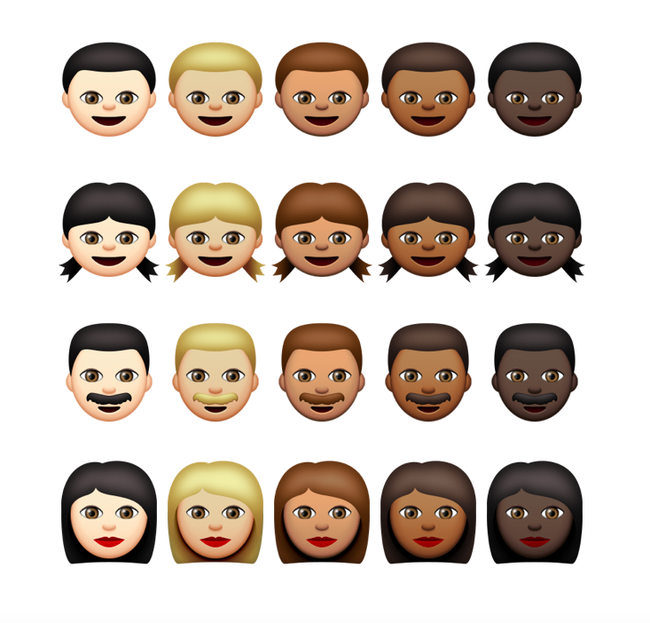 In addition to the above emojis, Apple is including a range of other characters (which are considered optional by Unicode) for skin tone modification. New to this update is a choice of family emojis. 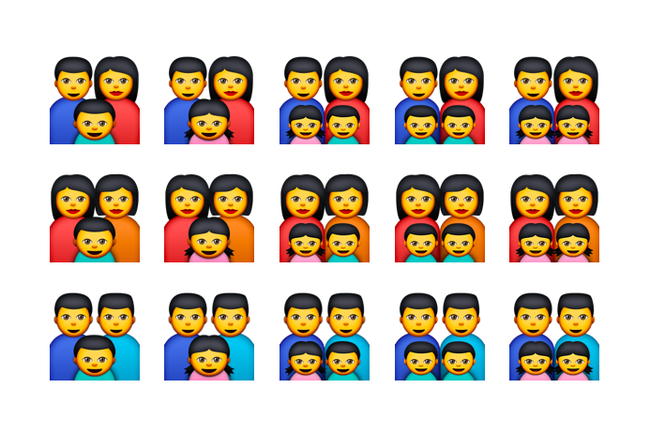 Options for these family emojis include any variety of two adults (men, women, or mixed), with one, or two children (boys, girls, or mixed). 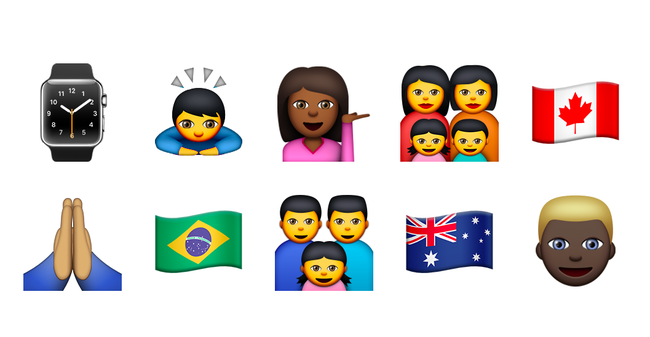 This is an increase to the options available, as the previous family emoji displayed only two parents (male and female) and one (male) child. Japanese carriers originally included a somewhat arbitrary list of 10 country flags in their emoji selections. These have been the standard emoji flags available on most platforms until now. 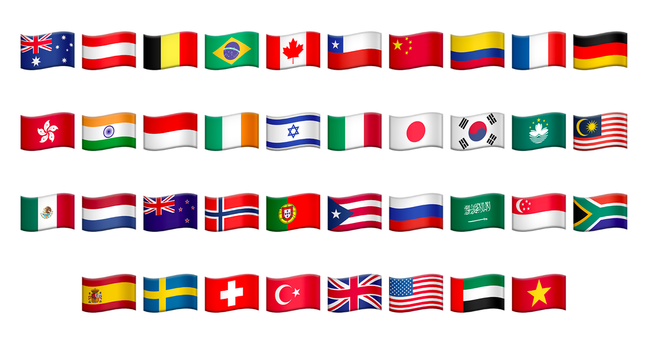 This emoji update introduces 27 more country flags into its emoji picker. Those boxes with two-letter codes above? These will appear as the correct country flag image on any platform that supports the new flags. This now includes Android 5.0, OS X 10.10.3 and iOS 8.3. In addition to the flags shown in the emoji picker, Apple has implemented hundreds of new emoji flags, which can be found here to copy and paste, as they are not in the picker UI. Google released 209 new emoji flags in November 2014, which are available on Android 5.0 Lollipop. 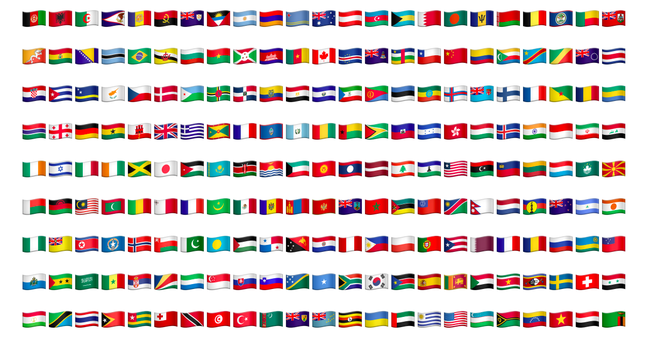 Microsoft has yet to make any country flag emojis available on Windows or Windows Phone. 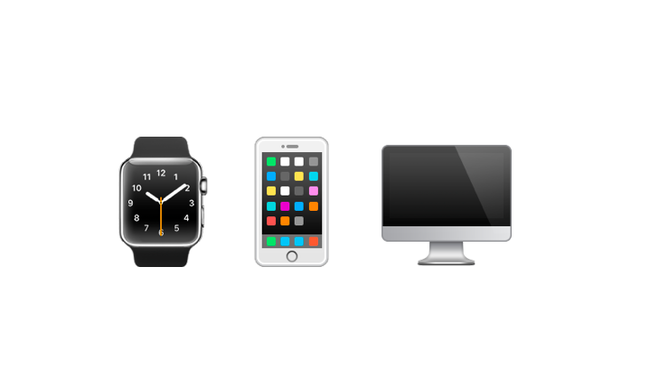 To keep pace with new product releases, Apple has updated the watch, computer, and mobile phone emojis to represent the Apple Watch, iPhone 6, and current iMac. Across various platforms, a range of groupings are used to categorize emoji characters. Most are similar, but none are the same. Apple uses five main categories in both iOS and OS X: People, Nature, Objects, Places, and Symbols. Emojipedia uses this same grouping for browsing. Within these categories, there are some unusual choices, but most people have come to remember where their most used emojis are located. 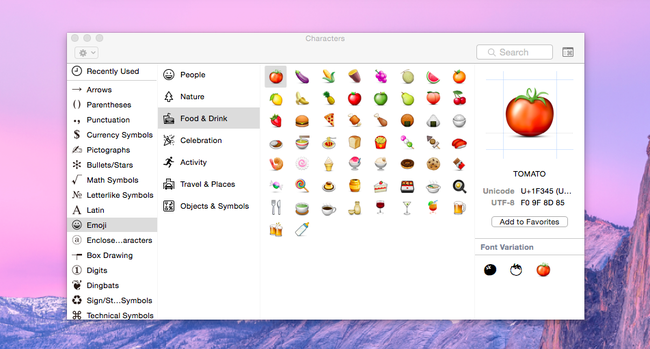 OS X 10.10.3 introduces three new categories: Food & Drinks, Celebration, and Activity. These mostly include characters previously in the People or Objects sections. 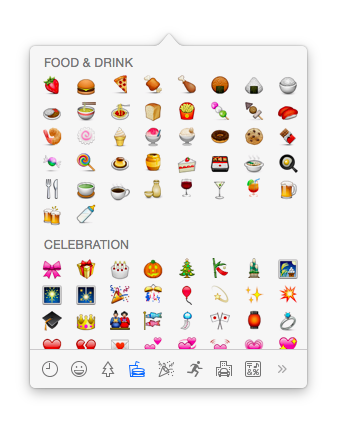 In addition to the new emoji categories, two existing ones are renamed and re-sorted: Travel & Places (mostly the same as the previous Places category), and Objects & Symbols (most existing symbols, plus objects that haven't been re-sorted into Food & Drink, or Celebration). The sort-order for emojis within each section has also changed in a number of instances. 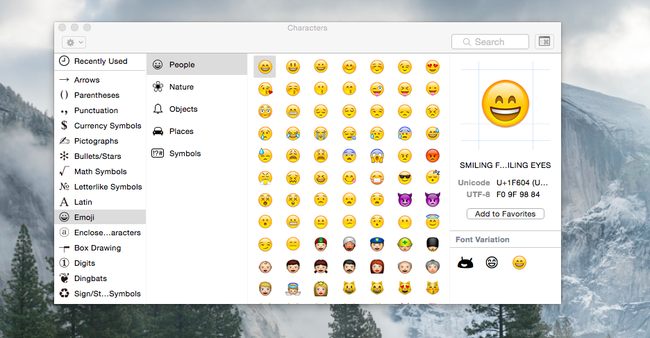 At this stage, there are no signs of the new Unicode 7.0 emojis being included in OS X 10.10.3, nor the Unicode 8.0 emoji candidates.